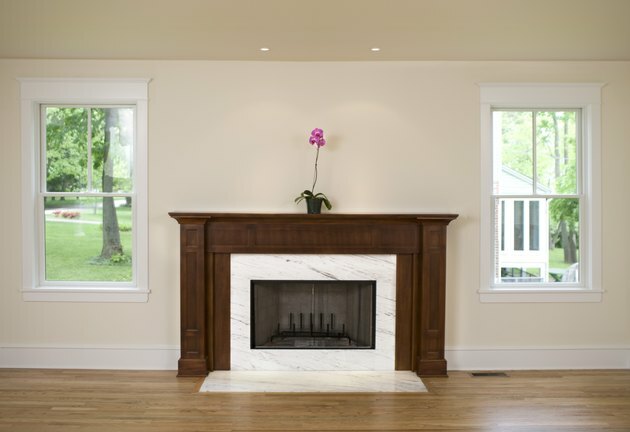 When you are not using your fireplace, it is the damper that keeps the outside air from entering your home. When the damper is not opening or closing properly, it can end up costing you money, according to the U.S. Department of Energy. If the damper is not moving smoothly, it may require some basic maintenance that includes fixing the handle. Closing the damper during the summer keeps the cool air inside your home. The damper is a crucial piece of hardware for any fireplace. It sits just above the firebox at the base of the chimney. When the damper fails to close all the way, air from the outside seeps into your home. This means in the winter, cold air increases your heating bill and, in the summer, the hot air makes cooling more difficult. It is essential to have a working damper to use your fireplace. If the damper door will not open, the smoke will pour out of the front of the firebox instead of going up the chimney. A proper handle makes moving the damper easier. Damper handles come in many styles, but the goal is the same regardless of the appearance. Usually you push up to open the damper door to clear access to the chimney. If the handle fails to open the door, you may need to do some basic maintenance that has less to do with the actual handle than it does the mechanism it triggers. Dampers, like handles, come in different styles. Some have hinges or spring mechanisms that allow the handle to open and close the door. Removing the soot buildup could free the door and get the handle working again. If the damper sticks, cleaning out the track and mechanism that moves the door will remove the debris that might be causing the problem. This is general maintenance that can be done when you clean the fireplace to avoid damper issues. Once you remove the grate from the fireplace, you can sweep or vacuum out the firebox. This give you access to the damper. When you open the door, a clean rag will free any soot trapped in the tracks. While you are cleaning, take the time to check any springs, latches or screws around the handle to make sure they are secure. Replacing the handle will fix the problem if it breaks or becomes loose. Many damper handles attach to chains for easy access. When the chain comes off, a replacement will be necessary. Installing a new damper handle is also a way to upgrade the hardware on your fireplace. If possible, take a picture of your damper and the old handle. Write down the make and model of your damper. This will be useful when purchasing a replacement part. The new handle must fit the damper specifications to work. In other words, you should select a handle from the same manufacturer as your damper or that is made to work with your unit. Follow the instructions that come with the handle for proper installation.